Our Mountain View drain cleaning professionals offer residential and commercial drain cleaning services to help home and business owners enjoy fully functional plumbing systems. We understand that plumbing emergencies do not follow business hours, which is why we offer emergency drain cleaning in Mountain View and Campbell. We are a team of professionals dedicated to ensuring that every home and business has high quality drains, pipes and sewer lines. Our Mountain View drain cleaners offer drain cleaning services to remedy a variety of problems. We can help to remove a solid object that has obstructed a drain pipe, such as a child’s toy. Our plumbers are also able to remove built up layers of scum and debris that have caused a clog to develop in a drain line. We also remove grease, hair and soap that has caused a drain to malfunction. In addition to fixing clogged drains, we also offer preventive maintenance services to help ensure that drains are always clear. While trees are a beautiful addition to your property, their roots can wreak havoc on your underground water and sewer lines. Old drain tile has just enough space so that a tree’s roots can grow through. As the tree roots grow, they expand the gap between the tiles. When the gap expands, waste water will no longer drain properly. In some cases, the tree’s roots can grow all the way through the drain pipe, resulting in a total blockage of the drain. Our rooter service in Mountain View and Los Gatos uses high powered jets to chop up the tree roots so that drains can return to full functionality. 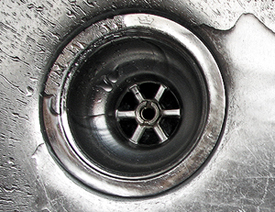 When a home or business owner needs drain cleaning in Mountain View or Milpitas, we are here to help. We are a full service company with experienced Mountain View drain cleaners. We work hard to ensure that every customer is fully satisfied with the work that we do. Our professionals arrive on time to every appointment, and our fully stocked utility vans have all of the equipment needed in order to perform the Mountain View drain cleaning services that we have to offer. Our Mountain View customers depend upon us for trustworthy, thorough and reliable service on their interior drains and main sewer lines.